In this February, 2017, file photo, Liverpool fans sing You’ll Never Walk Alone during a soccer match in Liverpool, England. Gerry Marsden walked into Liverpool’s Odeon cinema for a Laurel and Hardy film. It was raining when he started to leave, so he decided to stay for the second part of the double feature and watch the comedy duo one more time. And with that, a part of soccer history was born. Rodgers and Hammerstein’s Carousel was the other movie, and Marsden perked up during the second half. Manager Brian Epstein and producer George Martin – the management team of both the Beatles and of Marsden’s Gerry and the Pacemakers – were skeptical. But when the cover version was released in October, 1963, it became the band’s third No. 1 hit on the British singles chart. And then it was adopted by the Kop – the one-deck stand behind one of the goals at Anfield containing Liverpool’s most fervid supporters. 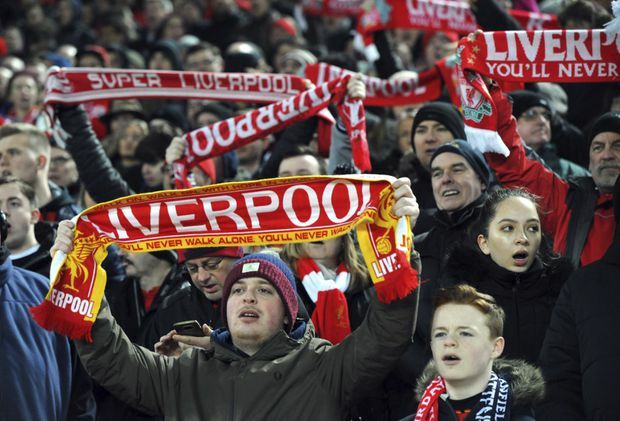 The famous tune will be sung Saturday by 16,000-plus Liverpool fans at Olympic Stadium in Kiev, Ukraine, before the Champions League final against Real Madrid, most holding banners with the song’s title. And it will be sung that afternoon and evening at Broadway’s Imperial Theatre by soprano Renée Fleming, nominated for a Tony Award for her performance in this season’s revival of the musical. Cover versions also have been recorded by Frank Sinatra, Elvis Presley, Aretha Franklin, Judy Garland, Ray Charles, Alicia Keys, Johnny Cash, Louis Armstrong, Olivia Newton-John and Barbra Streisand. Pink Floyd included the crowd singing it in Fearless. You’ll Never Walk Alone was the subject of a German documentary by director André Schaefer last year. Kent Roger Solheim, a Liverpool fan in Sandefjord, Norway, named his daughter, who was born on New Year’s Day, YNWA Sofie, according to reports in British media. The anthem’s genealogy goes back to Budapest and the 1909 premiere of Ferenc Molnar’s Liliom. The play opened on Broadway in 1921 and a 1944 revival starred Ingrid Bergman, Burgess Meredith and Elia Kazan. Molnar turned down offers from Giacomo Puccini and Kurt Weill to buy the rights, but reached a deal with Richard Rodgers and Oscar Hammerstein II, whose Oklahoma! transformed musical theatre in 1943. The pair shifted the action from Hungary to coastal Maine, and with music by Rodgers and a book and lyric by Hammerstein, Carousel opened at the Majestic Theatre on April 19, 1945, after tryouts in New Haven, Conn., and a short run in Boston. Christine Johnson sang cousin Nettie Fowler, the spa owner who consoles the pregnant Julie Jordan with You’ll Never Walk Alone after the suicide of Julie’s abusive husband, carousel barker Billy Bigelow. The 1956 film adaptation by director Henry King starred Claramae Turner as Nettie. Marsden’s version most likely played at Anfield for the first time on Oct. 19, 1963, before a 1-0 win over West Bromwich Albion. The top 10 hits of the week were played in reverse order before kickoff, and You’ll Never Walk Alone was No. 7. By the time the Reds returned to play Leicester on Nov. 2, it had risen to the top of the charts and was the last tune before kickoff. The song remained on top for the home match against Fulham on Nov. 16, but the fans kept singing it even after it was displaced at No. 1 by the Beatles She Loves You for the Burnley match on Nov. 30. Marsden got to speak to Liverpool manager Bill Shankly about the song at The Ed Sullivan Show in New York the following May 10. “He said, ‘Gerry my son, I’ve given you a football team. You’ve given us a song,’“ Marsden recalled. The song title is atop the Shankly Gates, dedicated outside the Anfield Road stand on Aug. 26, 1982, and moved in a 2016 redevelopment to the entrance of the Centenary Stand car park. It was added to the Liverpool club crest in 1992-93, and supporters of Scotland’s Celtic and Germany’s Borussia Dortmund also have adopted it. Fleming sang You’ll Never Walk Alone during the 2002 Concert for America at the Kennedy Center in Washington to mark the anniversary of the 9-11 terrorist attacks and at the 2009 Obama Inaugural Celebration at the Lincoln Memorial. Marsden performed it at Wembley before Liverpool’s win over Everton in the 1989 FA Cup final, just weeks after the Hillsborough disaster that led to the deaths of 96 Liverpool fans and at the 20th-anniversary memorial.